Created and originally posted by SHW on the Russian forum here. I am reposting it on this forum. 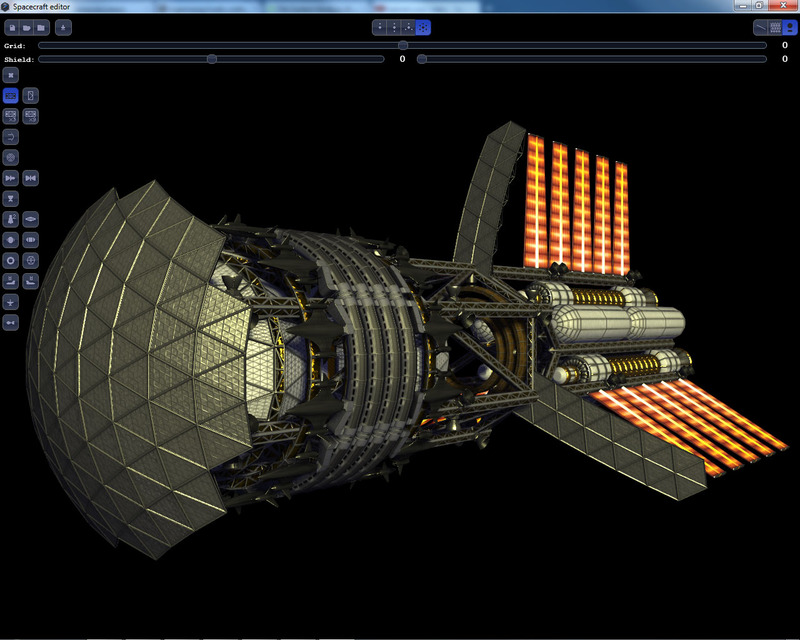 This is a prototype spacecraft editor for Space Engine. 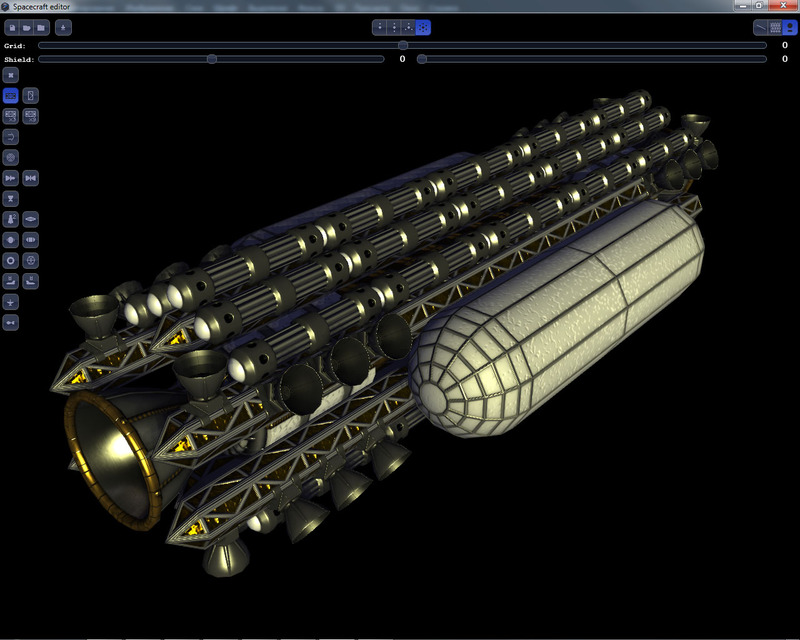 You can use it to create a spacecraft model from pre-made modules. 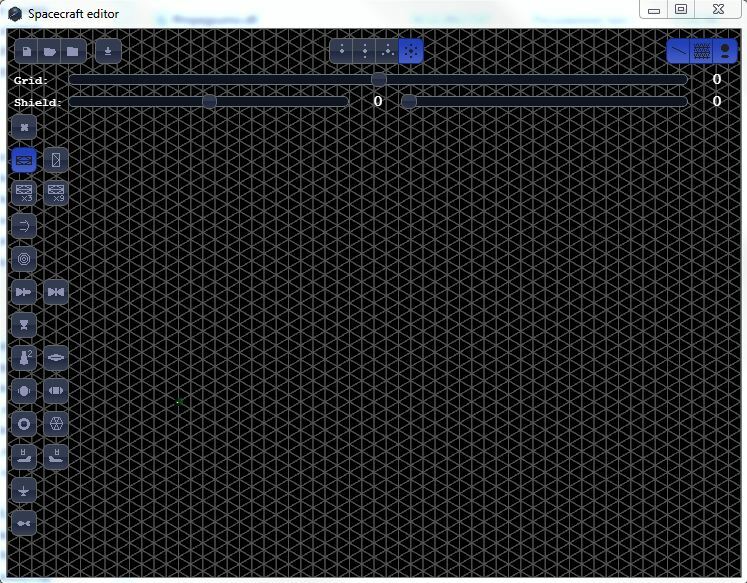 The downloadable "lazy" version (Windows only): editor.zip. Just download, unzip, and run the executable. The whole interface consists of a single window with a workspace for constructing the ship, and several toolbars. 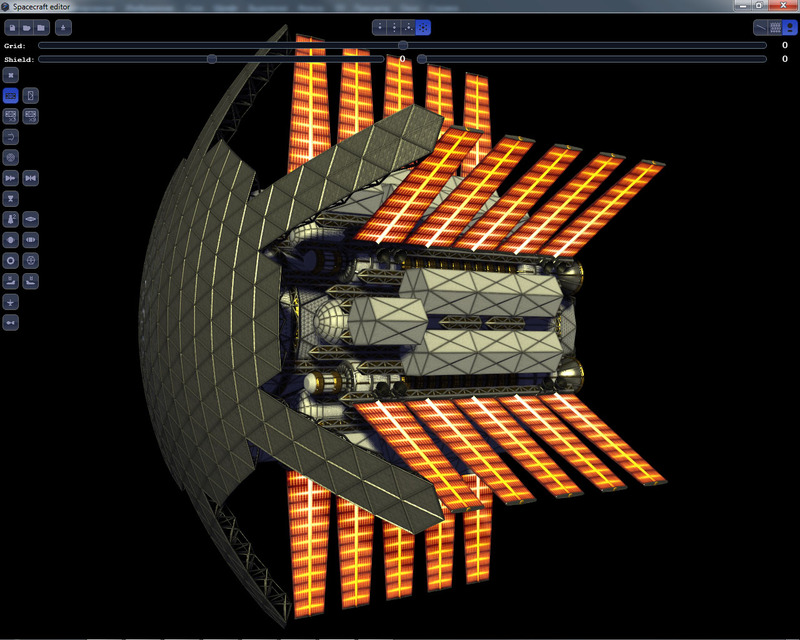 - In the top center are buttons to toggle the modes of symmetry with respect to the main axis of the ship. The options are no symmetry, two-symmetry, three-symmetry, and six-symmetry. This applies to both adding and removing modules. The ship is build from modules mounted to a framework. The framework itself, in turn, consists of longitudinal bars for the transmission of loads from the main propulsion engines to other elements, and crossbeams are used to increase the stability and rigidity. All modules are attached to a triangular grid with 15-meter steps in the transverse axis and 10-meter steps in the main axis of the ship. functional modules - these are inserted into the reference grid or attached to one of the side faces of the longitudinal beams. At all mounting points are pieces of longitudinal beam structure for further growth; If they are not needed they can be removed. meteoroid shield - added to the reference grid only, can be bent using the sliders. To transfer your ship into SE, select "Export spacecraft to .obj" (4th button from left on top) and save in your SE directory at /data/models/spacecrafts/. 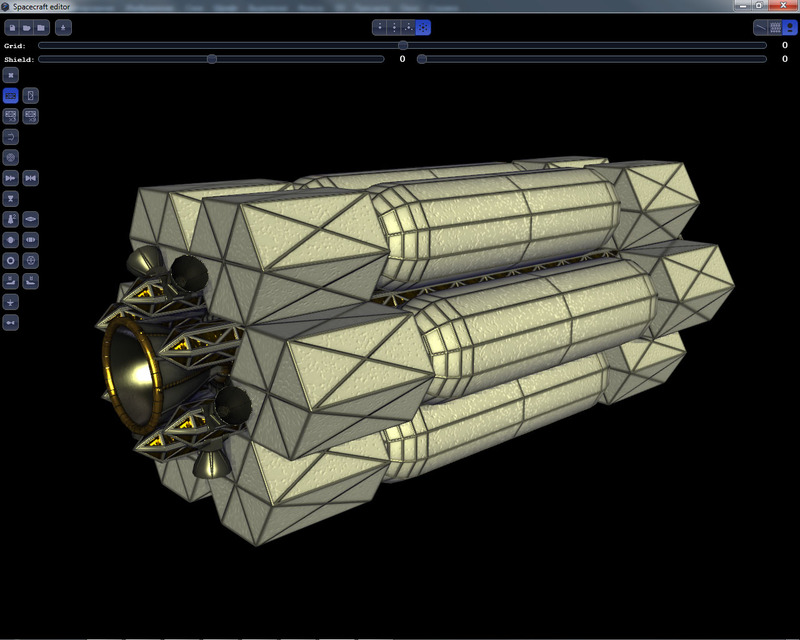 Then add the script for the ship into the ship catalog file (/data/models/spacecrafts/spacecrafts.sc). Longitudinal truss girder (x1, x3, x9) - the basis of the design. Fusion engine (single- and double-sided) - main propulsion and energy source. Radiative heat sink (double-sided and one-sided - twice as heavy at the same performance). Hyperdrive - local time accelerator for superluminal travel. Thermonuclear fuel tanks (can not be used as a very effective propellant). Residential unit (joined like train cars). Shuttle docking ring (attaches to residential unit). Quite a fantastic tool. Can't wait to see all the ships people come up with and I hope in the future support for custom parts is added. It's beautiful, seriously, it's the next step in taking space engine to a new level. As much as I disgree with the antiquated industrial aesthetic SE seems to be going with, this is incredible work. Well, this editor and many of the ships in SE now all reflect the designs of a single person. I have noticed other ship designs that look a bit different. But if you're commenting on the relative lack of curvy organic looking ships, then yeah there don't seem to be any. But those are not as easy to design, not easy to model, and are not as suitable to modular construction techniques. I might call it more of a functional design aesthetic, but Harb does have a point about modular design techniques. I'm checking it out now and the web version works in FireFox as well (so far), however I'd like to make those icons bigger. Just Ctrl+Mouse wheel in the program to adjust the icon size. Thanks. Also, how do you undo something? I'll try looking at the russian page though. Edit: Ctrl+ mouse wheel (or scroll bar, as I have a touchpad) doesn't work for me. It's not that it doesn't scroll as the scroll works for the zoom. Also, how do you undo something? To delete parts, use Ctrl-leftclick. There is no undo. In the web version, yes that will increase the zoom and thus make everything look bigger, but in the program itself it has no function, and thus would not help someone using the downloaded version. There is no information there that isn't here. Anybody having a problem where sometimes if you try to rotate, it'll rotate on the cameras center rather than along the axis? Not sure if it's because I'm using a touchpad mouse, but it's a bit annoying as I can't figure out what's making it rotate on the cameras center rather than rotate around the ship when I want to do so. Edit: Looked on the russian forum and someone over there is reporting the same problem as well. Sometimes it'll unstick, sometimes it won't. smjjames, it depends on where the camera is, how you've panned it, and possibly even whether you're holding Ctrl while rotating. This behavior is common to all 3D modeling programs I've used, so it's almost certainly neither a bug nor a glitch, just something that may seem annoying to people unaccustomed to such programs. Possibly, and I've never used 3D modelling programs before either. If it isn't a bug, it should be clarified for those not used to that kind of behavior in 3D modelling programs. Ooooh, this is really nice, might have to plan out my own design and get it built. I've had the camera issue too, it may not be a bug per se, but the behavior should ideally be changed to something more consistent. Once it happens, it can be very difficult to get it to return to normal behavior. But if you're commenting on the relative lack of curvy organic looking ships, then yeah there don't seem to be any. But those are not as easy to design, not easy to model, and are not as suitable to modular construction techniques. Yes, it's been my opinion that given the mood, gameplay, and setting proposed for SE, ships should have a more organic aesthetic. As I've said before, I love the designs by SHW and others, but they really don't suit my vision of Space Engine; they're almost like a gritty dust speck in a beautiful eye. And (while I think the setting would have optimal, set designs for ships) I also don't think creating a modular ship creator with this aesthetic would be all that difficult, just requires some coding skill I'm sure is well within SpaceEngineer's power, and after seeing this program, probably SHW as well. Furthermore, I don't imagine the ships having very complex geometry anyhow. Because I seem to often refer to this, I just made a main post about it.